The United States’ intentions for regional settlement can clearly be seen in two decisions in US President Donald Trump’s first term. 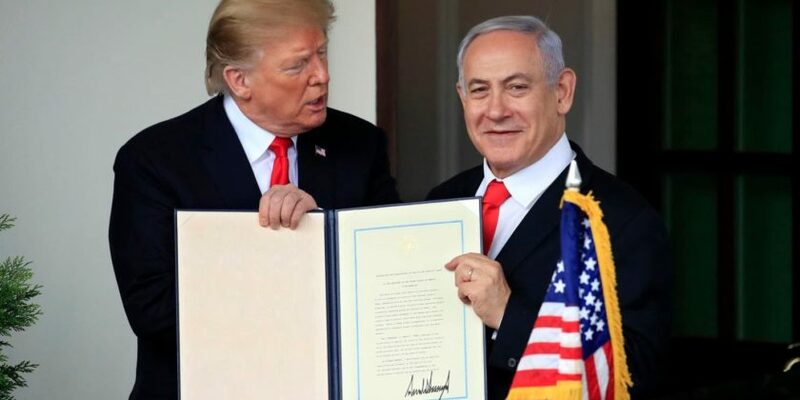 The recognition of Jerusalem as the capital of Israel and the announcement that the US Embassy will be moved there, as well as the recognition of the occupied territories in Golan heights as Israeli land. These were simple enough decisions which no significant resistance could stop, but the shock value of these policies could mean that when key stakeholders come back to table for settlement negotiations they have a more realistic expectation of what the outcome might look like. Therefore, It won’t be any surprise if there is already an American consensus toward Israel annexing part of the West Bank. While this approach from America has surprised many, it may be just what is needed given the fragmentation of Arab countries. Interestingly these policies do not appear to have created the kind of anger and political pressure to resist that would have been expected several years ago. The region has transformed from being politically aware, having strong national and cultural spirit and a desire to resist. Financial and economic factors now weigh more strongly on the minds of people in the region. Much of this shift is a result of public policies where the state has relinquished is role in key services such as health and education to oligarchs who have privatized basic services. A stark example of the change in regional attitudes is from 1990 when Saddam Hussein invaded Kuwait. The Late King Hussein of Jordan was in a difficult position following the 1989 uprising and an economic crisis, but he was obliged to support Saddam against the international coalition. While this is a position that would be considered a political mistake now, Jordanians at the time felt a national responsibility to support their close neighbor and were willing to accept the additional economic hardship that resulted from sanctions and embargoes. In the 30 years since, we have seen society in the region change with a new political and social psychology. The relationship between citizens and government has completely shifted as people no longer trust the political system and do not see it as credible with accusations of corruption and perceptions of decadence amongst the political class. In this context, discussions of the issues in Palestine are focused on economic solutions, and Washington’s regional proposals are built around economic peace. This approach makes sense to people as it provides solutions for many of the problems that citizens of the region are facing in their day to day lives. With the current drastic economic conditions and lack of opportunities, economic peace provides hope for a better future for the people. It is definitely important to have social unity and nationalism, but policies and mistakes of the past have eroded people’s livelihoods such that they now require more basic desires to be satisfied first. Further, the risks and challenges the region is facing cannot be addressed with populist slogans alone, concrete actions and progress are also needed. The legitimacy of the governing class is derived from people, and in order to maintain this relationship it is imperative to adopt more transparent policies that actually improve people’s lives and give them hope for the future.